I’ve noticed a new trend in Abigail behavior lately. It was pretty easy to notice; I’m not a noticing expert or anything. It was frankly hard to miss. Before we get started with this brief photographic journey, I’d like to stress that I didn’t see her do any of these things. I simply walked into the room and there they were. It’s possible aliens did it, but I suspect Abigail. It started with this first image, which seemed to need no further explanation. It was worthy of photographing and sharing with others and I thought that would be the end of it. As you can see, the area belonging to baby Kylie has been clearly demarcated. There are really no questions as to whether you should step into Kylie’s space or not. 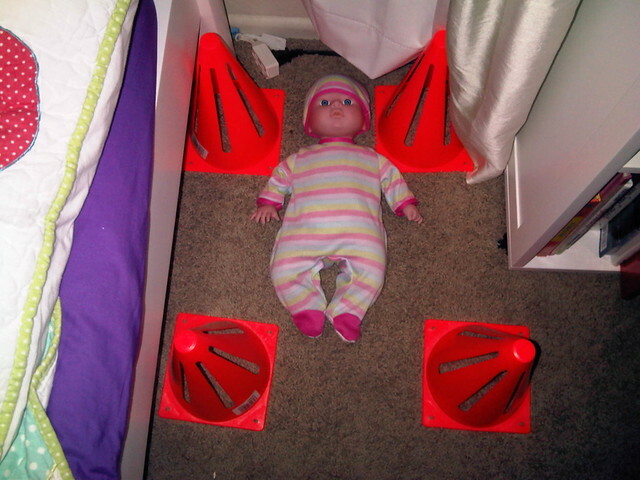 The cones are obviously there to protect both the baby and the baby observer from having any unnecessary interactions. Plus, the baby probably wanted to sleep. Kylie was now in a similar arrangement, but in another room. You’ll note that her space is not nearly as well defined as in the earlier instance, but we can pretty well see where the baby and the baby observer should be. You might accidentally tread on her toes, but in the end, that’s okay; she’s actually made of plastic. While I’m sure we can all agree that this is the most awesome of the three images, by several orders of magnitude, it also offers up several questions. 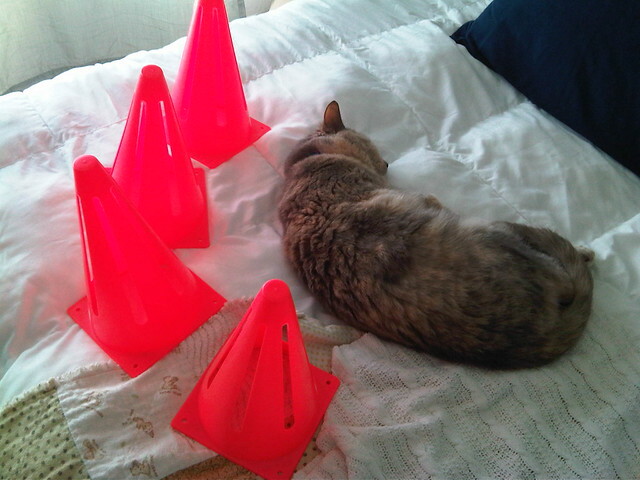 Am I to stay only on one side of the cones? Which side? Is it simply that Limbo is concerned about being assaulted from behind? Which area is hers and which belongs to the cat observer? It is possible that more cone arrangements will spontaneously appear in the future. If they do, they may answer these very questions. You will be the first to know. If you’re the first to read the post, anyway. Otherwise you’ll be second, third, or wherever you end up in the reading order. It’s unlikely you’ll be more than the 25th or so to know, though, based on my standard readership. 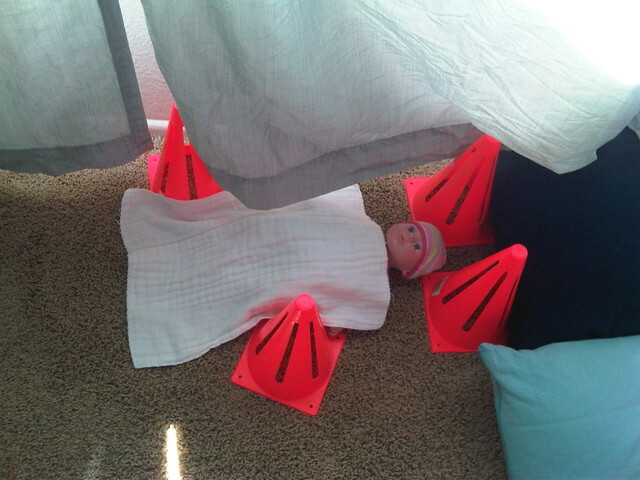 This entry was posted in Abigailia and tagged Cones. Bookmark the permalink. I think I might need my own set of cones. That is soooo awesome. my cats might need some cones of their own.